We design and build all clay dryers custom to our customers’ requirements. The choice for the ideal drying system depends on your products and your drying process. We use rotary air mixers or pressurized wall systems to ensure the right air circulation in your dryer. Because you need an ideal air mixing system to accurately homogeneously dry clay products. Also a very accurate control of temperature and humidity (air aggressiveness) is a requirement. We therefore control temperature and humidity during the whole cycle in order to ensure optimal drying. We equip our clay dryers with sensors, technology and control systems to ensure fast and energy efficient drying. Gas heating is advised for larger industrial dryers. For specialty dryers and smaller volume electric heated dryers are a good alternative. Besides dryers we also integrate kiln and dryer car(t) transportation systems. We developed our “CHINOOK” ® control system specifically for clay dryers. The Chinook control system is an advanced and very flexible control system. Besides flexibility, it is intuitive and user friendly. The Chinook system controls the humidity level and temperature in the right proportion. It enables a faster drying compared to regular clay drying systems. Therefore energy consumption is minimized. In order to optimize the humidity in the drying cycle, it is often a benefit to have the option of active humidification. Therefore we provide humidification systems as an optional feature on our drying systems. The Chinook control system for clay dryers measures and controls the relative air humidity. 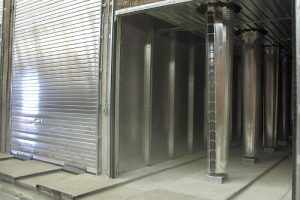 During the drying cycle, it is often required to increase the actual humidity level in the air to evaporate water faster from the center of the clay products. In order to optimize this proces, we offer humidification systems. An automated humidification system increases the relative humidity at any moment in the drying cycle, if required. Temperature is controlled by using gas heaters or alternatively electric heating. In order to reduce energy consumption, we aim to re-use heat from kilns. This can be, depending on the circumstances, a primary or secondary heat source for your dryer. A Blaauw Clay Dryer is the right piece of equipment for fast and efficient drying cycles. Due to the flexible programming of the chinook control system it is very easy to use different drying cycles for different types of products. You can program an optimized drying cycle for each specific type of load. Most importantly: with a Blaauw clay dryer you reach the maximum possible capacity in your production. Drying will not be the bottle neck any more. If required, we integrate available waste heat from kilns in our drying systems in order to save energy and cost.